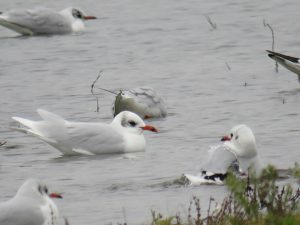 The monthly club I go to, the Young Naturalists, is usually held at Blashford Lakes a Hampshire & Isle of Wight Wildlife Trust nature reserve, but this time we went to Pennington marshes to do a bird survey and look at what we could see. Pennington Marshes consists of salt marshes, mudflats and small pools separated from the sea by a man-made sea wall stretching from Keyhaven to Lymington. 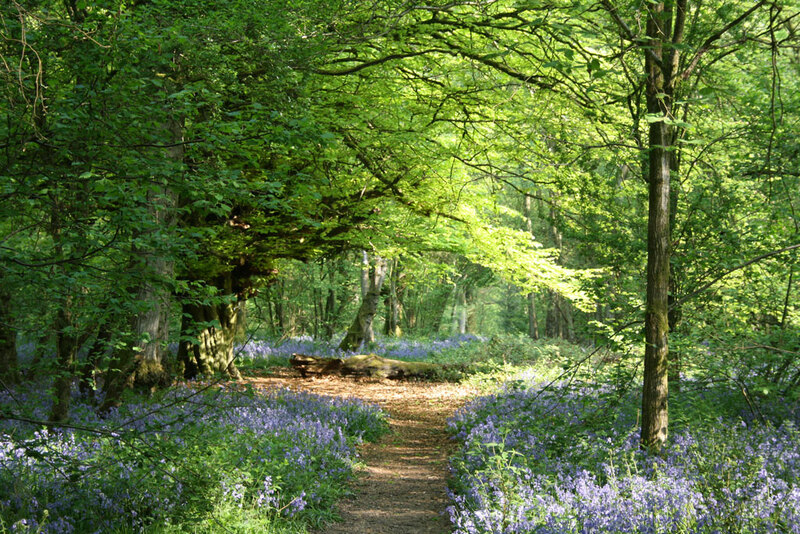 This area is a perfect stopping point for migratory wildfowl and waders and also a permanent home for many animals. In all we saw 74 different species of birds over the 3 hours we spent there. 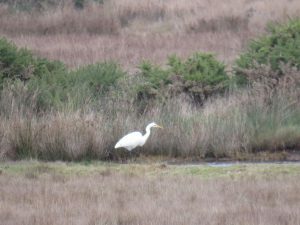 The list included; a Peregrine Falcon, a Great White Egret, a Gold Crest, Pintail, 3 Spoonbills, Mediterranean gulls, Marsh Harriers, Dartford Warblers, Brent Geese and so much more. 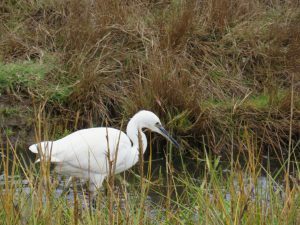 Other than its size a simple way of distinguishing a great white egret from its smaller cousin, the little egret is by the colour of its beak. 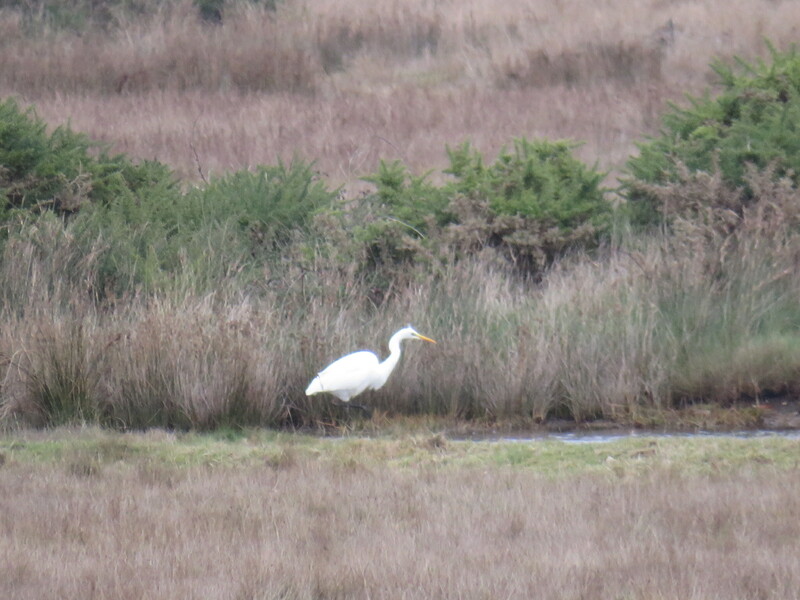 The GWE has a striking yellow beak whilst the LE has a black beak. 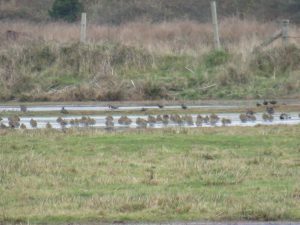 Below is a blurry long distance photograph of a large flock of golden plover and lapwing also in there (somewhere) is a ruff, a bird that seemed to never stand still. 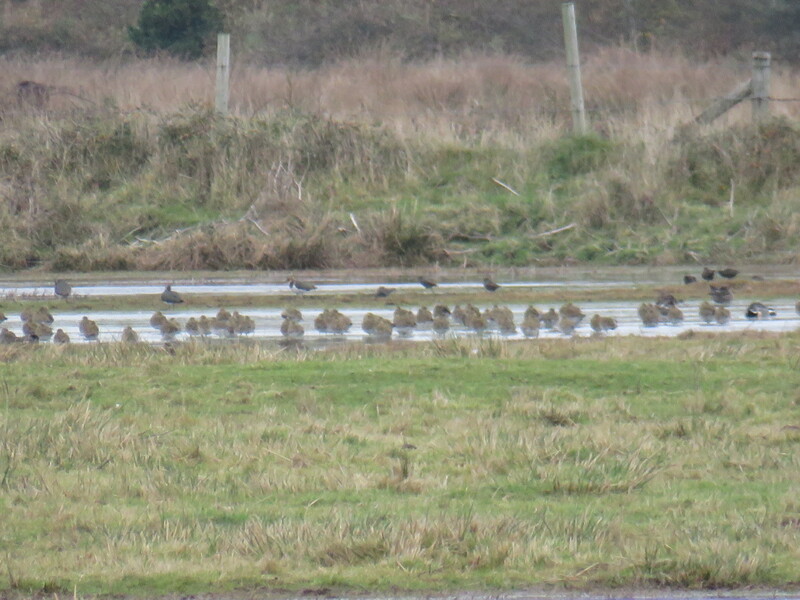 On the reserve there were also other large flocks of birds like dunlin, redshank and even a flock of Knot which I was thrilled to see. 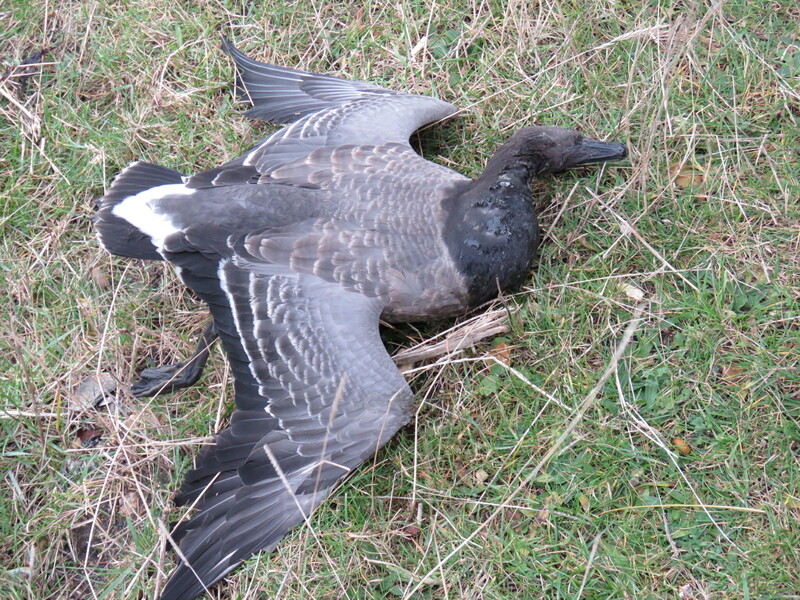 Unfortunately we also encountered a deceased juvenile Brent goose that had probably fledged this year on the Taymyr peninsula, in northern Siberia and migrated all the way to the shores of Britain only to die for no apparent reason, predator or illness, right by the path at Pennington marshes. 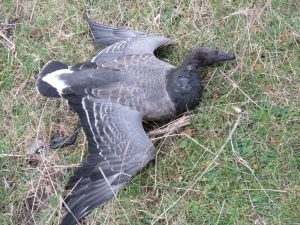 Luckily the Brent geese population is doing well this year but some years not one juvenile has been spotted in the British isles. 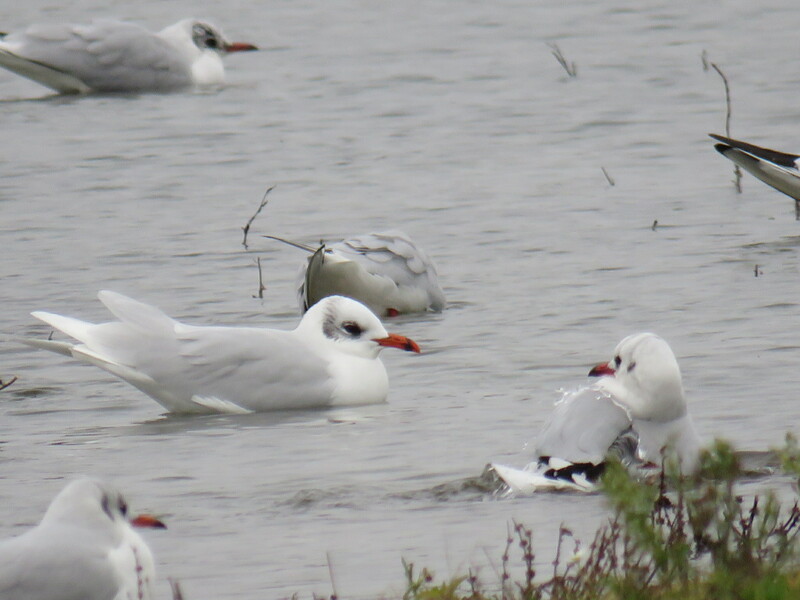 There were about 20 Mediterranean gulls in amongst the black headed gulls. This one was bathing and showing off its white primary feathers.